Engineering training provider South West Durham Training is celebrating after winning an award for its apprenticeship scheme. 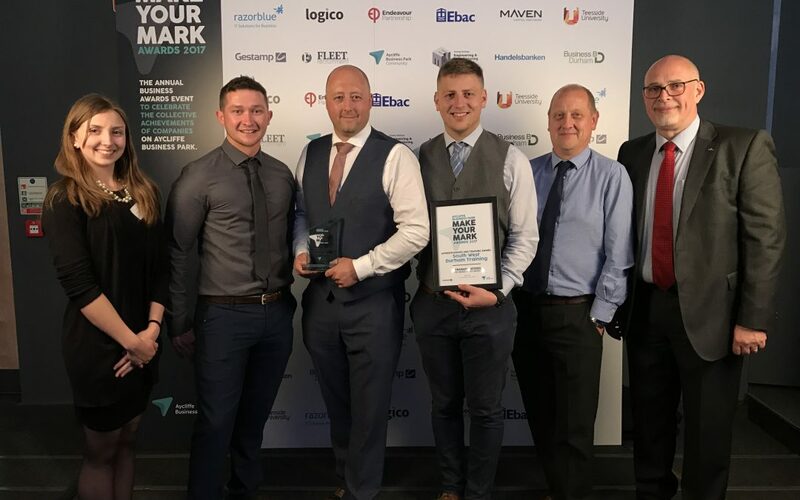 SWDT was nominated by businesses on Aycliffe Business Park for the Apprenticeship and Training Award, sponsored by Gestamp, for implementing an apprenticeship scheme as an integral part of developing its workforce. The 400-hectare business park is home to more than 500 businesses employing around 10,000 people and its fourth annual Make Your Mark Awards ceremony, hosted by BBC Radio Five Live presenter Charlie Charlton, was held at The Xcel Centre. More than 200 people attended the event, with 52 nominations for the 11 award categories. The top award of the night – Company of the Year – went to Stiller Warehousing and Distribution. SWDT, which marked its 50th anniversary last December with a big ceremony of its own led by BBC Breakfast’s Steph McGovern, is well known for training apprentices for other companies. But it also employs its own apprentices. Jason Howe, General Manager at SWDT, said: “The award is special as it is nominated and judged by companies on the Aycliffe Business Park. It is great recognition for the continued hard work and commitment of our staff and fantastic students.